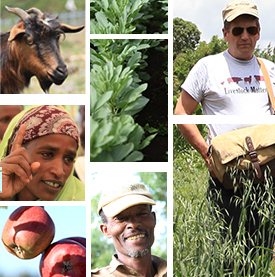 In this video, Peter Thorne, the Africa RISING project coordinator in Ethiopia, and Melkamu Bezabih, a postdoctoral livestock feeds and nutrition researcher, talk about sustainable intensification of mixed farming systems in Ethiopia in the Africa RISING project. This video was recorded during an international exchange visit organized near Debre Birhan (one of the research sites of the Africa RISING project in Ethiopia) as part of the 7th Multi-stakeholder partnership meeting of the Global Agenda for Sustainable Livestock. Under the theme ‘Achieving multiple benefits through livestock-based solutions’, more than 250 participants from over 50 countries came together on 8-12 May 2017 in Addis Ababa, Ethiopia, to discuss how livestock can contribute positively to global development. The meeting comprised a mix of plenary and interactive sessions, learning tours, a share fair and opportunities to join one of several special interest cluster and action network meetings. Tags: GASL, Peter Thorne, sustainable intensification. Bookmark the permalink.